Rustic chic is in abundance with this gorgeous Tapered Raw Concrete Table and 2 Bench Set. Raw Concrete adds dimension and character to any space inside or out. This Tapered Raw Concrete Table and 2 Bench Set includes the 2.5 metre Raw Concrete Tapered Table with matching benches, for a marvelously modern look. Rustic chic is in abundance with this gorgeous Tapered Raw Concrete Table and 2 Bench Set. Raw Concrete adds dimension and character to any space inside or out. 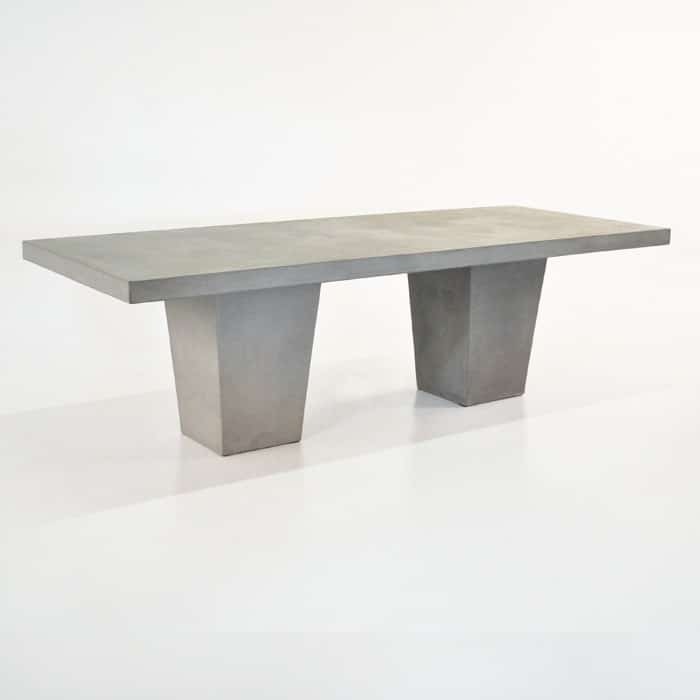 This Tapered Raw Concrete Table and 2 Bench Set includes the 2.5 metre Raw Concrete Tapered Table with matching benches, for a marvelously modern look. Made of a composite concrete mixed with resin, the pieces are not as heavy as 100% concrete and help maintain its shape and form. Try the benches with one of our recycled teak tables for a fabulous contrast in texture. The Tapered look adds a grand element to the table, making it ideal for fabulous dinners and events at home. The Raw Benches are a simple double ‘T’ perfect for adding to this chunky table! 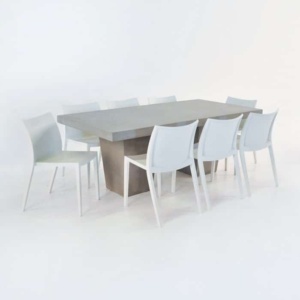 Our Raw Concrete is actually a composite product, made with resin and fibreglass. Meaning it still looks and behaves like concrete but the material is stronger and lighter than a complete concrete item. Concrete is a porous product, so it is inclined to change being outdoors. You can expect it to absorb liquids that aren’t mopped up (unless you choose to seal it) and you may find hairline cracks from the heat, these won’t affect the overall integrity of the table, but will add character and unique flavour. Design Warehouse specializes in furniture for the great outdoors. The majority of our stock has been stamped with the marine grade label – meaning that they are resilient, durable and of course gorgeous pieces of furniture for outdoor use. Choose from loungers, dining sets and deep seating in Grade A Teak, Reclaimed Teak, Stainless Steel, Batyline® Mesh, Textilene® Mesh, Resin and Sunbrella® fabrics. It is why we have been the top suppliers of outdoor furniture for over 20 years, because quality is everything. Design Warehouse is open 7 days a week, ready to take your queries, orders and take you through our product. 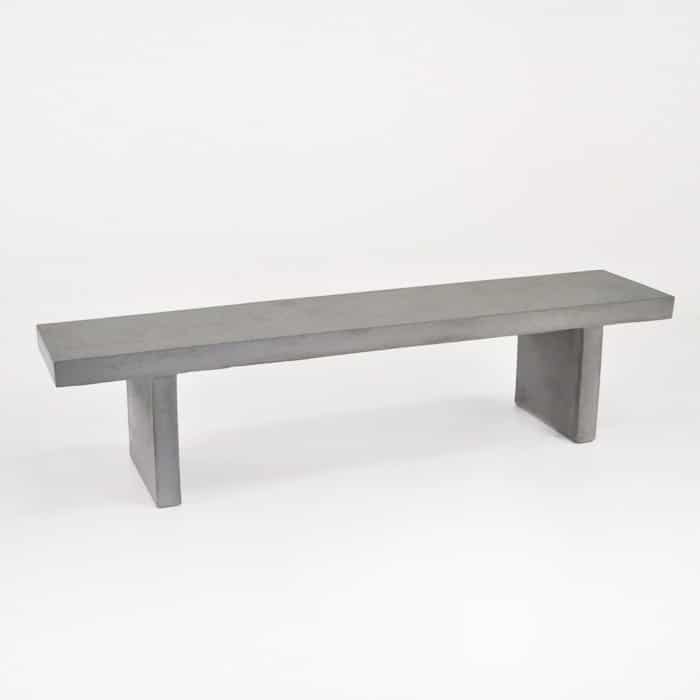 Try the Tapered Raw Concrete Table and 2 Bench Set within a contemporary, chilled, structured environment to take advantage of the modern style of your space. The state of the art Tapered Raw Concrete Table and 2 Bench Set will add style and a bit of grunt to any area with its hardy use of concrete material – try it on a rooftop deck with wicker and aluminium low dining chairs for a really industrial look. Or perhaps you’re after an edge to your beautiful, blooming garden? Place this set with surrounding raw concrete planters for good measure. 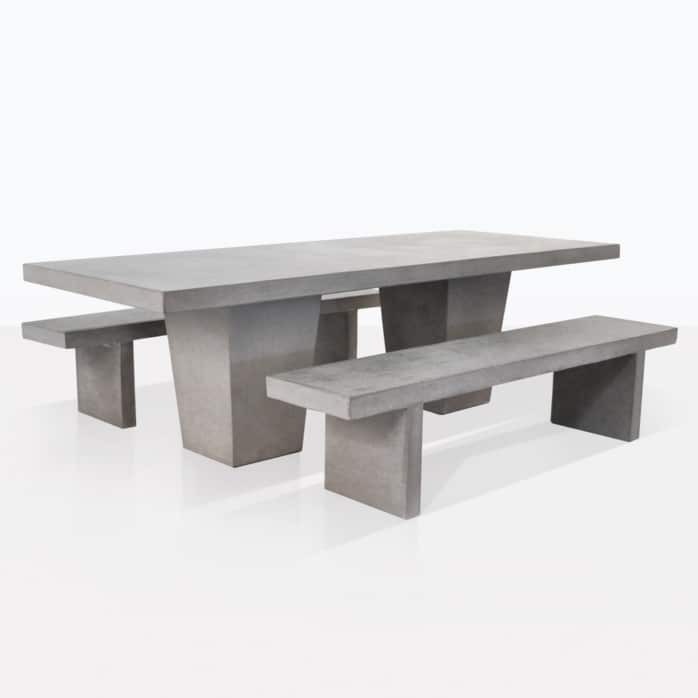 You’ll soon be breathing in the scent of flowers whilst hosting glamorous dinner parties on this effortlessly stylish Tapered Raw Concrete Table and 2 Bench Set. Dress your Tapered Raw Concrete Table with rustic wooden plates filled with delicious salads and goblets of wine and fill your Benches with your nearest and dearest. Pull the look together with some wood-look All Weather Wicker Arm Chairs on each end. You’ll be in heaven. The Tapered Raw Concrete Table and 2 Bench Set is a beautiful set that suits many spaces. Put it in yours today.